For the TIME PERIOD of April 1945 to Oct 1947 a political war of words evolved concerning my Polish Military Awards. This involved our former allies the Free Polish Government in Exile, the newly establish communist Polish Government, the British Government and of course the Government of Canada. During the time period that it took this controversy to play out, I had returned to Canada, had postings in Canada, returned to Europe for several posting with the MRES, and then returned to Canada for further postings. My involvement in the controversy was minimal, I had to supply what documentation I had obtained for my Polish awards and contact a few of my former Polish AK superiors. I was certainly an "interested spectator" to what unfolded! It was quite the saga! Unfortunately John Duncan had to go through a similar ordeal. 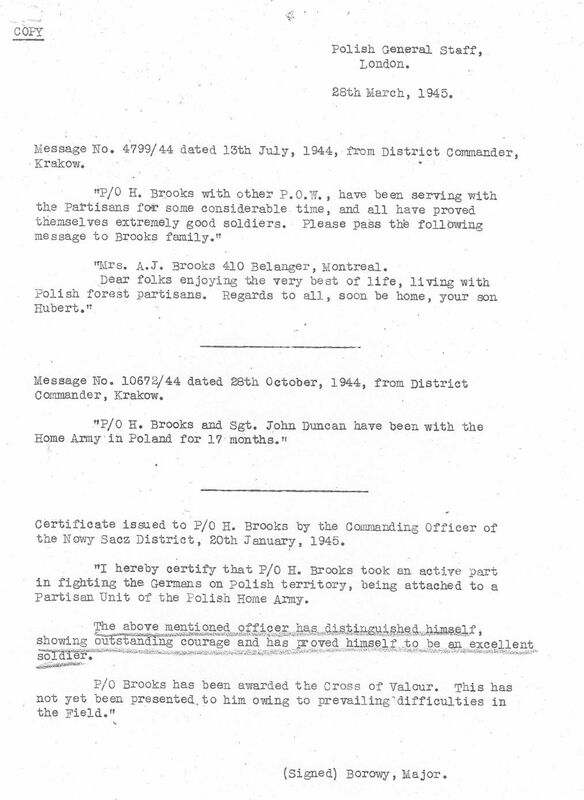 D Hist cards also indicate that he (Brooks) was awarded the Polish Cross of Valour and Polish Silver Cross of Merit with Swords (authority given as C-J94368 DPC dated 15 October 1947). There is no AFRO, Canada Gazette or London Gazette entry to confirm this, and Government House Chancellery Division has no record of the awards. Did the Poles bestow them and Canadian authorities decline or forget to acknowledge these honours? The answer, found in his documents, is a fascinating study of political and diplomatic protocol blended with common sense. Indeed, Hubert Brooks’ career as a partisan had become rather embarrassing to the Canadian government. Late in 1945, the Polish government in exile, based in London, awarded him the Polish Cross of Valour and Polish Silver Cross of Merit with Swords. Normally, these would have been formally "gazetted" and announced in the London Gazette and Canada Gazette, but the Warsaw–based Polish government, which had been installed by the Soviets, objected, saying that they and not the London–based organization were the sole arbiters of Polish awards. The question of Hubert Brooks’ two Polish medals occupied RCAF and External Affairs minds until October 1947, when Air Vice-Marshal Hugh Campbell wrote that " no gazetting should take place" (thus giving Warsaw no grounds for complaint), but that Brooks should be allowed to wear the appropriate ribbons and medals–an "officially unofficial" solution that appears to have satisfied all. As an aside, none of these Polish General Staff messages were passed on to my family in Montreal…. presumably the military had their reasons to keep my presence with the AK secret. 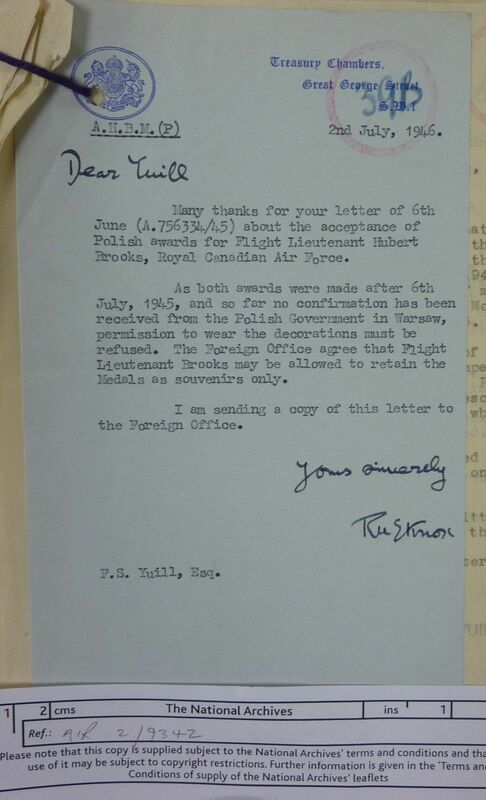 Before the Canadians took a run at sorting the issue as to whether or not Brooks could wear his Polish medal awards without restrictions, the British through the Central Honours Committee and debated this for a period of about 5 months. This letter repeats essentially verbatim the 2nd July 1946 from Sir Robert Knox. "As the two decorations were awarded to the above noted officer by the Polish General Staff on January 20th 1945, and not after July 6th 1945, as you were led to believe, may this headquarters be advised, please, if permission to wear the decorations may now be granted." To: Sir Robert Knox, H.M. Treasury, Great George Street, S.W. "Will you please refer to my letter (39A) as of the 6th of June and your reply (39B) of the 2nd of July regarding the Silver Cross of Merit with Swords and the Cross of Valour presented to F/L Hubert Brooks of the RCAF. We have now been advised that both awards were approved by the Commander of the Polish Home Army in January 1945 and I attach, fyi, copies of the certificates that have been forwarded to us by the Canadian authorities who are anxious for the permission of F/L Brooks to wear the decorations without restrictions. In view of the circumstances, I shall be grateful if you will let me know whether, in view of this further information, the Committee will now give approval for acceptance of these awards." 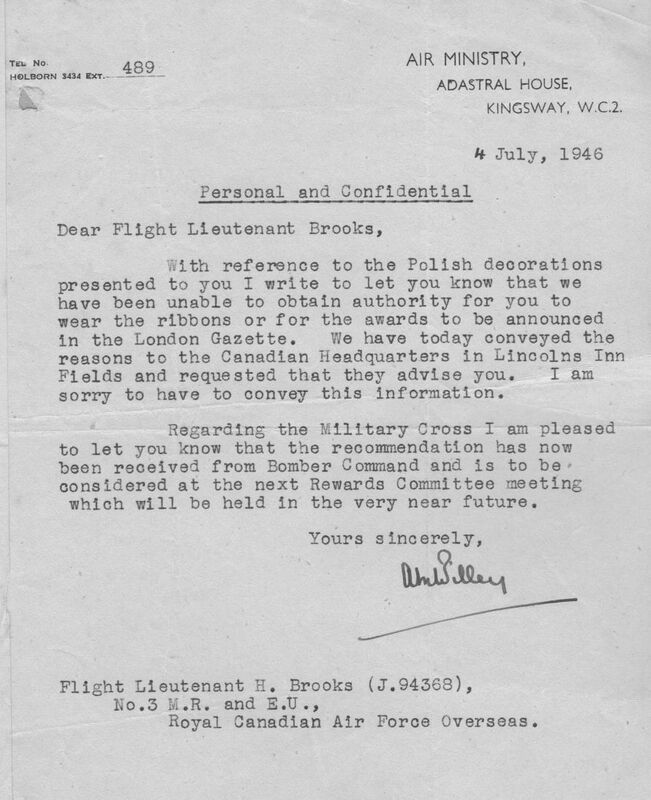 "With reference to your letters of 16th September and 2nd December 1946,this is to inform you that the Central Honours Committee has not as yet, given authority for F/L Brooks to accept and wear without restrictions the Polish decorations presented to him." From: Sir Robert Knox, H.M. Treasury, Great George Street, S.W. "With reference to the Air Ministry letter dated 5–Dec 1946 a reply has been received from the Central Honours Committee. An extract is appended which is self-explanatory." At this point the CANADIANS took over…..
"The Provisional Polish Government in Warsaw has recently protested about the issue of Polish decorations except under their authority. Group Captain Bohuszewicz, who signed the certificate produced in support of the application for permission to accept the awards for Flight Lieutenant Brooks, does not function under the authority of the Warsaw Government". 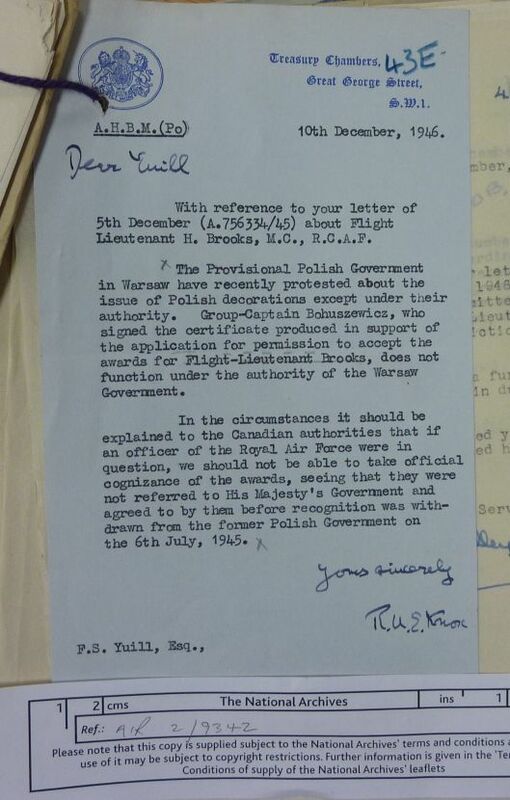 "A reply has been received from the Central Honours Committee relative to your Polish awards, to the effect that if you were a Royal Air Force officer it would not be possible to take official cognizance of the awards in view of the awards not having been referred to H.M. Government and agreed to by the Government before recognition was withdrawn from the former Polish Government, 6th July 1945. 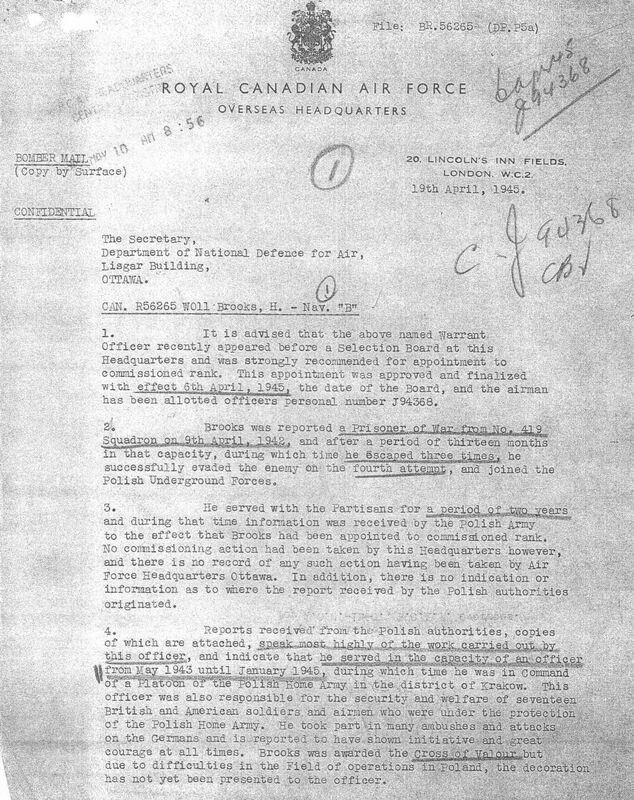 Inasmuch as you are a Royal Canadian Air Force officer however, it is desired to bring this matter to the attention of Air Force Headquarters, Ottawa, for their comment." "I would like to inform you that F/L H. Brooks was awarded, on January the 20th, 1945, the Polish Cross of Valour, and on January the 25th, 1945, the Silver Cross of Merit with Swords. The above awards were made by the Commander of the Polish Underground Army in Poland during F/L H. Brooks' service there between May 1943 and 26th January 1945. 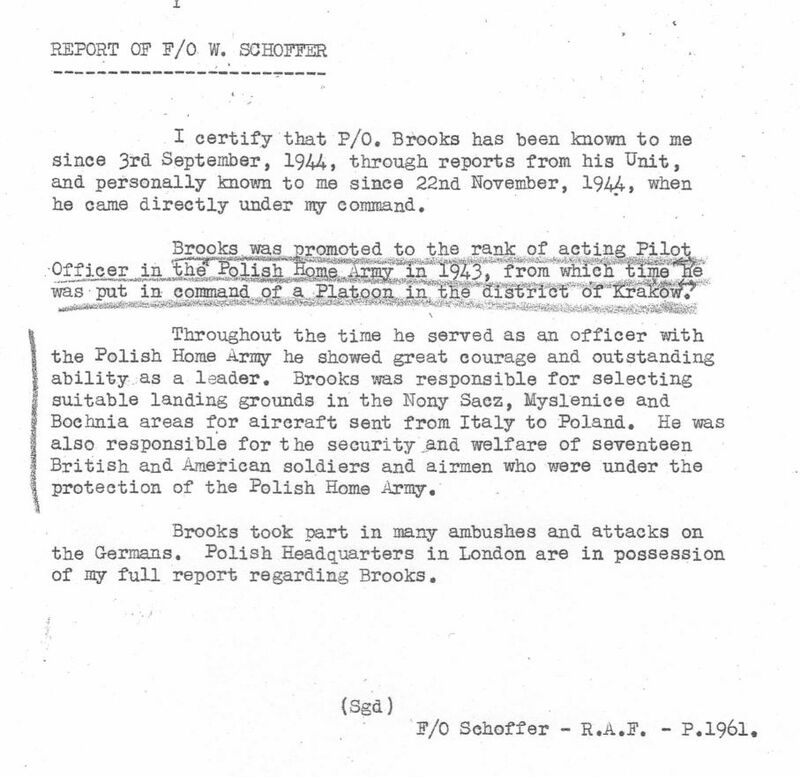 When F/L H. Brooks returned to England and proved his awards by special certificates given to him by the Commander of the Underground Army, they were confirmed by the President of the Republic of Poland in Exile. The Cross of Valour was presented to F/L H. Brooks on December the 6th 1945, and the Cross of Merit with Swords on June the 6th 1946. I enclose a certificate authorising F/L H. Brooks to wear the Silver Cross of Merit with Swords." It is certified that F/Lt. Hubert Brooks, born 29.12,1921, Alberta, Canada – has been awarded the CROSS OF VALOUR on the 20st January 1945, by the Commander of the Polish Home Army for his generous courage and bravery during his service in the Polish Underground Army from May 1943 to 26st January 1945. Identity card dated 6 December 1945 and issued by Polish General Staff, noting that P/O Hubert Brooks is entitled to wear the Cross of Valour; further noted: "Award published in the "Gazette of the Personal", No.2 dated 8 March 1946 and signed by Group Captain W/ Bohuszewicz. Translation of a Polish document dated 20 January 1945. I certify that the bearer of this certificate P/O Hubert Brooks took part in engagements against the Germans on the Polish territory among the groups of the Polish Home Army / A.K./. The above mentioned officer distinguished himself with courage and bravery and has been awarded the Cross of Valour. The decoration has not been presented because the award should be confirmed by the (Polish) Government in London. 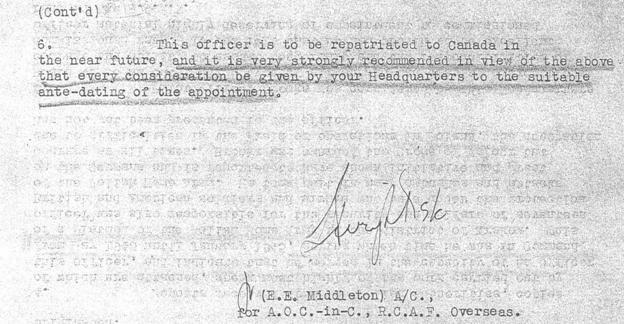 Document dated London, 4th June 1946, from "General Staff"
It is certified herewith, that the Commander of the Polish Home Army by order of the 20th January 1945 has conferred the SILVER CROSS OF MERIT WITH SWORDS on F/Lt Hubert Brooks for bravery during his service in the Polish Home Army in Poland from May 1943 to 26 January 1945. Document issued in London, January 1947 by "Polish General Staff"
It is hereby certified that F/L H. BROOKS was awarded the Silver Cross of Merit with Swords during his service in the Polish Underground Army in Poland from May 1943 to the 26st January 1945, and is entitled to wear the above named decoration. 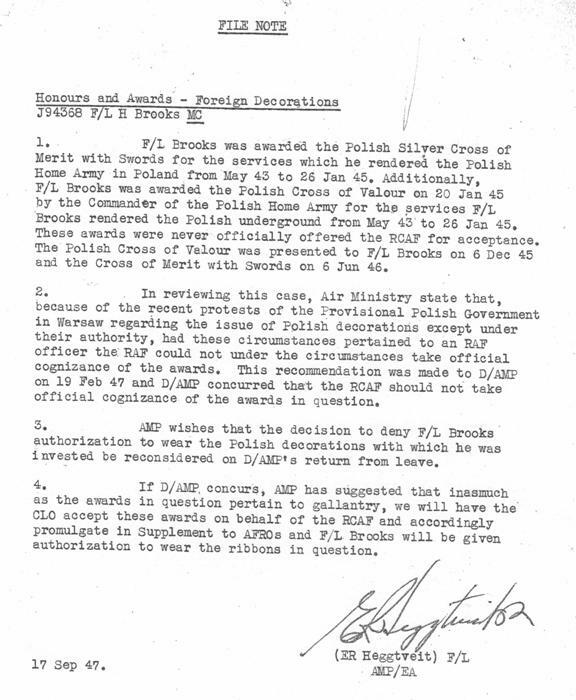 Hereunder is correspondence received from CLO concerning Polish recognition for the a/n officer for services rendered the Polish underground forces subsequent to his escape from POW camps, Germany. F/L Brooks was awarded and invested with the Polish Cross of Valour and the Polish Silver Cross of Merit by persons who, it appears, do not presently function under the Warsaw Government. From Appendix "A" (correspondence hereunder) it seems that the Warsaw Government has been strongly protesting regarding the issue of Polish decorations except under their authority. The Polish authorities did not enlist the acceptance of these awards from the RCAF. 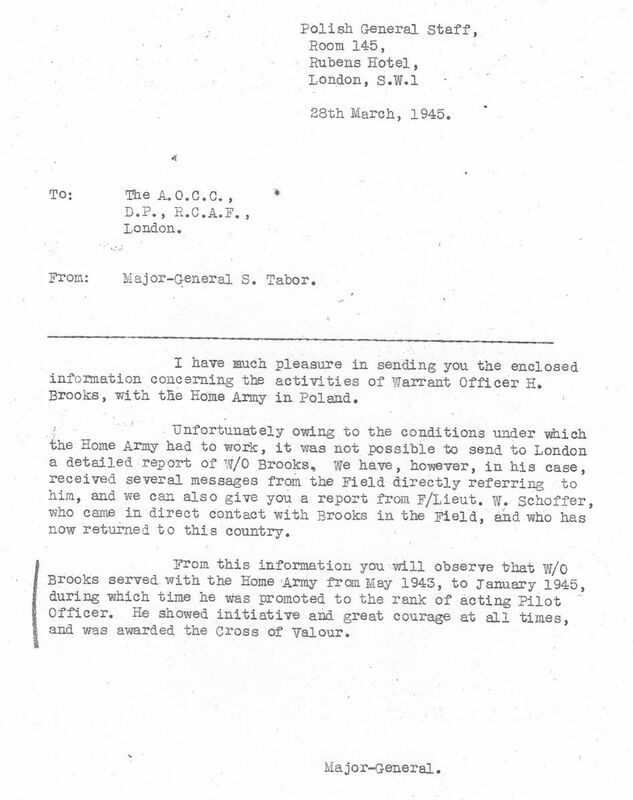 F/L Brooks received the MC for services rendered prior to and subsequent to his escape as a POW and RCAF policy dictates that a foreign gallantry award will not be accepted where the gallantry in question has been recognized by the award of a British decoration. In view of the possible political embarrassment involved, it is recommended that the RCAF does not take any official cognizance of the Polish awards in question, and if you concur the CLO will be requested to inform the Central Honours Committee accordingly. In reply to your referenced correspondence, it is advised that the RCAF will not take official cognizance of the Polish awards with which the a/n officer was invested. It is requested that the Central Honours Committee be advised accordingly. The a/n officer who was recently taken on strength of this HQ, and posted to your Division for duty, was awarded the Polish Silver Cross of Merit with Swords and the Polish Cross of Valour for meritorious services rendered the Polish underground forces subsequent to having escaped from German custody as a prisoner of war. 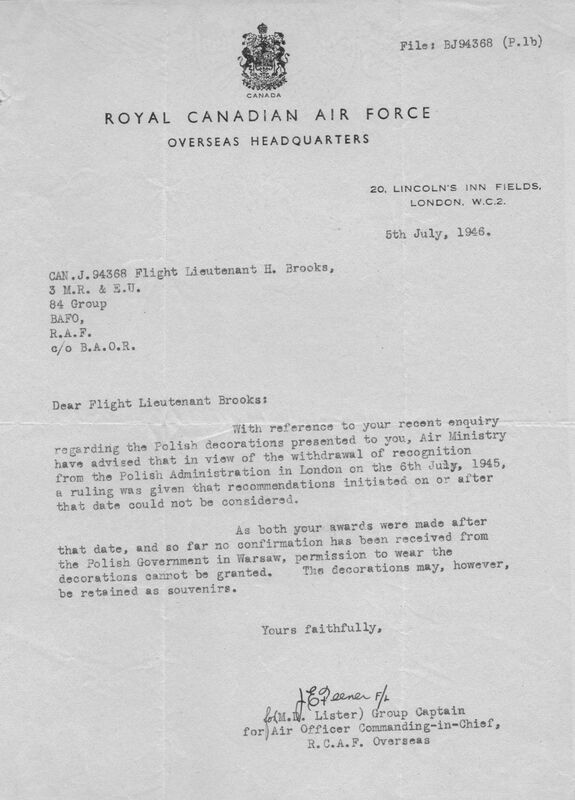 It will be observed from the folios in this file that official RCAF recognition of these awards was withheld from this officer, even though the awards were confirmed by the President of the Republic of Poland and F/O Brooks had been invested with the actual insignia. This course of action was taken because of the complicated political picture in the country concerned and the attitude adopted towards this subject by the British authorities due to the unstable nature of the government in question. It will be noted at flagged folio "A", however, this HQ has taken cognizance of these awards by virtue of having F/O Brooks' records annotated accordingly, although no promulgation action in either the Canada Gazette or AFROs was taken. On reviewing the whole case, it has been decided that our previous ruling in this case should now be interpreted as granting permission for this officer to wear the ribbons of these awards on Service uniform in addition to the recording action taken, but as in the first instance, no promulgation action will be undertaken at the present time. In view of the above, may F/O Brooks be informed that permission to wear the ribbons of the Polish decorations in question is granted. Sadly as a related epilog, John Duncan experienced similar difficulties with the British Army authorities. On 25–July–1946 he was also awarded the Silver Cross of Merit with Swords by the Polish Army for bravery with the Polish Underground Army. The British War Office refused him permission to wear his award by decree on 12–Feb–1946 ref no 68/GEN/8044 (MS3L). This was rather "rich" as it had been the British Government (through the RAF) that had specifically asked John and I to remain in Poland and fight out the rest of the war with the Polish AK partisans.